This was first posted as a letter to the editor in the Las Vegas Review-Journal on November 22. 2013. It has been re-posted here with permission from the author. In response to the article on Education Secretary Arne Duncan (“Duncan again slams those who oppose Common Core,” Monday Review-Journal), Mr. Duncan’s writing off of opposition to Common Core state standards as political silliness didn’t work. Throwing the tea party under the bus didn’t work. So now Mr. Duncan is bashing “white suburban moms.” Is it because he lacks the testosterone to verbally attack the fathers? Or is it because Mr. Duncan is just table-pounding mad that America’s moms — of all ethnicities — have not only called “fail” on Common Core standards, but we are also quite possibly the only group left in America that has not been bought by Bill Gates’ money. Our children are not for sale, and no amount of verbal abuse from Mr. Duncan will change that. Was Mr. Duncan’s remark — “white suburban moms who — all of a sudden — their child isn’t as brilliant as they thought they were” — perhaps meant to insult us on some level? You bet our children are brilliant and funny and smart and sharp and thoughtful, and no arbitrary methodology of assessing or testing them will change that. Furthermore, shame on the mother who doesn’t think that about her child. 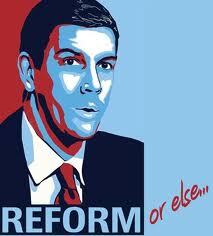 Mr. Duncan has just ensured the demise of his national education program and subsequent federal takeover. In one sentence, Mr. Duncan managed to rub an entire country of mothers the wrong way. I feel confident in saying that collectively, our No. 1 concern is that we keep our children out of harm’s way, and Mr. Duncan is harmful. He has been given a great deal of power, and his abuse of that power has been appalling. His refusal to admit that the standards may be flawed or may need to be revisited is the scary part of this entire scenario. One man, completely inflexible, should not be given this much power. The standards have been in place in several states for more than two years. Mr. Duncan has heard from academics, professionals, superintendents and teachers, not to mention psychologists (several of whom are nonwhite moms), who have said the standards are lacking, inappropriate and overreaching at certain grades and, in general, will bring down the academic level of our teens graduating from high schools. However, instead of taking a look at the standards themselves and the less-than-qualified individuals who wrote them, Mr. Duncan chooses to lash out at anyone and anything in a pathetic attempt to keep us from focusing on the obvious. No, Mr. Duncan, poking a stick at the mama lions was not your most brilliant move. Don’t bother with an apology, because you’ll never be heard over the deafening roar. 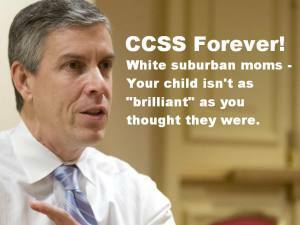 This entry was posted in Duncan, Pushback and tagged CCSS, Duncan, pushback by chascherrie. Bookmark the permalink.